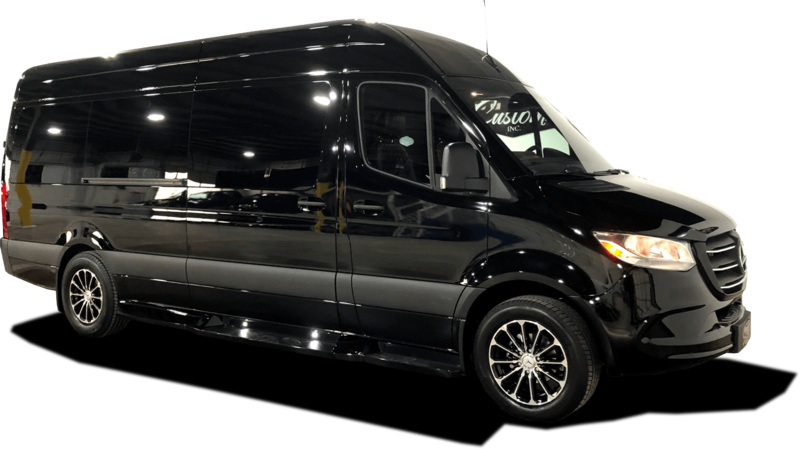 The First Class Customs Inc. VIP COMBO SPRINTER. The Limo VIP Combo was designed to combine the best of both worlds! This Combo Sprinter offers seating for Four VIP Captain Chairs with optional Workstations in addition to, the Four Person Bench Seating with optional Power Folding Bench. This Model Features an all new Custom Bar Console w/Liquour Cabinet. This combo model is perfect as a mobile office or for entertainment purposes. (4) VIP Captain Chairs (4) Person Side Bench with optional Power Fold. Driver & Co-Pilot Seats Recovered to Match Color of Rear Seats.